German Neo-Nazi Sentenced To Life For Murders Beate Zschaepe was found guilty in the murders of 10 people, most of whom were immigrants. The victims were gunned down between 2000 and 2007. Beate Zschaepe arrives for the verdict at a court in Munich, Germany. She was convicted for the murders of 10 people who were gunned down between 2000 and 2007. A German court has found a member of a neo-Nazi group guilty of 10 murders after a five-year trial and has sentenced her to life in prison. Nine of the victims were immigrants, and the prosecution said the killings were racially motivated. 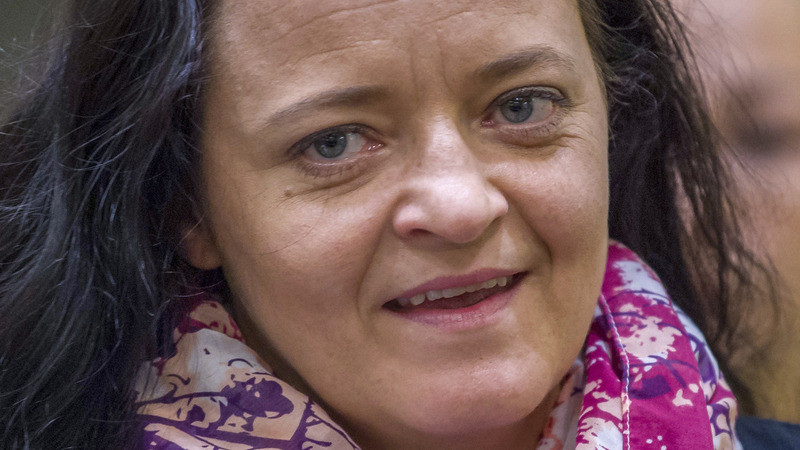 Beate Zschaepe, 43, was the main defendant on trial for the murders and the last surviving member of a terrorist cell called the National Socialist Underground. Zschaepe had shared a flat with the two other members of the cell, who died in 2011 in an apparent suicide pact. Police found the bodies of Uwe Mundlos and Uwe Boehnhardt in a burned-out van after an attempted bank robbery. The BBC reported that a fire at their home was "apparently an attempt to destroy evidence" and led to Zschaepe turning herself in. The three, over several years, waged a neo-Nazi campaign, which included two bombings in Cologne, bank robberies and the murders of eight ethnic Turks, a Greek citizen and a German police officer. Most of the victims were fatally shot with a handgun while they were at work. Zschaepe denied taking part in the murders, which occurred between 2000 and 2007, but said she should have done more to stop them from happening. Zschaepe's defense lawyer, Mathias Grasel, told The Guardian he would appeal her conviction. "Instead of punishing Zschaepe as a representative, a constitutional democracy has to be able to bear it when the true culprits can no longer be prosecuted for their cruel crimes," Grasel said. The Guardian reported, "The sentence was largely as a result of the state prosecutor's opinion that even though the court could not prove Zschaepe had been present at any of the crime scenes, she 'had been aware of, contributed to, and in her own way co-piloted' the neo-Nazi cell's killings." The judge found the killings had racist motives and were designed to spread fear and insecurity among immigrant communities. Four other men were convicted on Tuesday for helping the NSU cell and sentenced to prison terms ranging from 2 1/2 to 10 years. Dirk Laabs, co-author of a book about the NSU, told The Guardian, "If you look at the sentences for Zschaepe's co-conspirators, this is an unbelievably soft verdict. It's hard to imagine people accused of supplying weapons and logistics for terrorist activity would have got off so lightly if this had been a trial about an Islamist cell." Critics said a central question was unanswered: How did the NSU terrorist cell evade detection from German authorities for so many years? At the time of the killings, police blamed German-Turkish gang violence. According to the BBC, German media referred to them as the "Bosphorus murders," or the more derogatory "doner murders." Doner is a name for a Turkish kebab. In 2013, NPR's Soraya Sarhaddi Nelson reported that many "among the 3 million people of Turkish descent who live in Germany are angry, saying the murders and aftermath highlight prevalent racism not just in society but in the government. They want to know why German authorities failed to uncover — let alone stop — the terror campaign against them." The Telegraph reported that evidence emerged during the trials "that several intelligence informants were in contact with the group, and an intelligence officer was close to the scene of one of the killings." According to The Guardian, "Many experts question how the trio could have gone undetected for so long without a sizable support network across Germany."